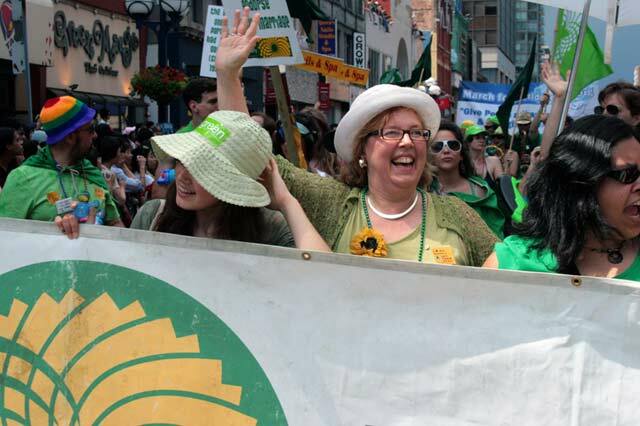 Photo of Elizabeth May at 2008’s Pride Parade by Shaun Merritt from the Torontoist Flickr Pool. WORDS: Get up close and literary with Elizabeth May at Ben McNally Books this evening. The bookstore hosts a launch for May’s latest book, Losing Confidence: Power, Politics, and the Crisis in Canadian Democracy, the Green Party leader’s plea for a renewed political agenda. The evening begins with a talk from May, followed by a Q&A session and book signing. Ben McNally Books (366 Bay Street), 5–7 p.m., FREE. THEATRE: Set in an imaginary world between heaven and hell in a downtown halfway house called Hope, Stephen Adly Guirgis’s time-bending dramedy The Last Days of Judas Iscariot is a big show with big ideas. The plot invokes characters ranging from Pontius Pilate to Sigmund Freud, with each called to testify in a trial of God and the Kingdom of Heaven versus Judas Iscariot. A courtroom drama with philosophical debates and existential themes, the Birdland Theatre production asks difficult questions—if God is all-forgiving, why is Judas suffering in hell?—with a serio-comedic touch. Fermenting Cellar (55 Mill Street), 8 p.m., $40 at www.totix.ca. FAMILY: The Ontario Science Centre’s latest interactive exhibit, “Science of Spying,” began on Thursday and is open this Easter Monday. Upon arrival, visitors are recruited for training as a “spy for the day” and embark on a secret mission while learning skills such as code breaking and lie detection. Spy gadgets such as night-vision goggles, spy planes, and hidden cameras are also on display. Ontario Science Centre (770 Don Mills Road), 10 a.m.–5 p.m., $18 adults, $13.50 youths/seniors, $11 children. AWARENESS: Today is the first day of the second annual LGBTQ Health Matters Week, which promotes awareness about the health and well-being of lesbian, gay, bisexual, trans, and queer people in Ontario. There are several events happening around Toronto, including an acupuncture open house, a talk with Rainbow Health Ontario about LGBTQ issues, a workshop for LGBT seniors, and a gay men and partners’ cancer support group meeting. Events take place throughout the day, see website for schedule and details, FREE. MUSIC: Crew for the Cure, comprised of riggers, stage hands, technicians, and other entertainment industry members, develops and provides benefit concerts for various charities. Tonight’s concert, “A Tribute to Tristan,” is headlined by harp master Jerome Godboo and Pat Rush, with guests Jeff Jones and New Country Rehab. Proceeds go towards the Cancer Assistance Program. The Mod Club (122 College Street), doors open at 8 p.m., $20 at Soundscapes, Rotate This, and Grateful Head.